At this point, I’m pretty sure that everyone and their pet squirrel has heard about 7 Wonders – it was one of the most talked about games of the last year, and that was before it won the first ever Kennerspiel des Jahres award, the newest offspring of the Spiel des Jahres family for more complex games. So we are a bit late to this particular party, but you didn’t really think that was going to stop us, did you? The theme of 7 Wonders will hardly surprise you: you take control of one of the early civilisations that build the Seven Wonders of the Ancient World and control their fate through three ages of civilisatory development and maybe erect the wonder that made them famous. Anyone who played a certain series of computer and board games – and that’s a considerable amount of people – will immediately think of sending settlers across the map, founding new cities, researching new technologies and maybe wiping out the opposition in a long campaign across the board. And they’d be dead wrong, but they might not be at all disappointed. 7 Wonders is the opposite of every other game that ever asked you to build a civilisation across three ages of development: instead of a big map and a bunch of miniatures or even paper tokens for your military units, you play with a player mat, three decks of cards and – yeah, okay – some paper tokens, but they do not represent units of any kind. The player boards – of which there are, predictably, seven – show the monument that you’re building with beautiful illustrations by Miguel Coimbra as well as your Wonder’s special ability and starting resource. The game is then played with the three decks of cards, one for each age. The cards represent different achievements of civilisation that go in the respective age – a selection mostly based on the author’s imagination and basic what-you-need-to-have-before-you-build-something-else, the ages in 7 Wonders don’t correspond to time periods like the stone age or the iron age and you probably don’t want to learn for your history exams by playing. What is important about the three ages is that they don’t all contain the same types of cards; especially the absence of anything producing resources in age three can put you in a tight spot if you forget about it. You start each age with seven cards from that deck. Don’t get too attached to them. All players pick one card from their hand simultaneously and play it, then pass on the remaining cards to the player to their left in ages one and three and to their right in age two. With less than 6 players, you will see those cards again – what’s left of them – but you shouldn’t rely on the card you really wanted to be still available. Cards can be played simultaneously as well, if you trust the others not to cheat with their resources. There is three ways to play a card. The simplest one is to discard it and take three coins in return. The most common one is to play it for the building or technology they represent and reap the benefits they confer. Those benefits are numerous and key to winning the game, but first you have to pay for the card when you play it. Some cards are free. Those are easy. Others you pay with coins. Also easy enough: take coin, put in middle of table. The majority of cards, however, has a price in resources. Now that’s … still easy. 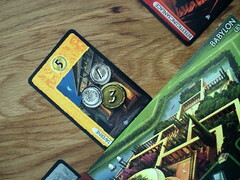 You just need to spend 30 seconds to understand 7 Wonders‘ resource system. There is a bunch of different resources – bricks, wood, ore, glass, cloth etc. 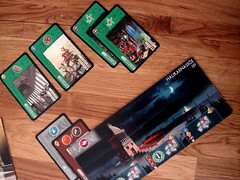 – and many cards from the first two ages produce these resources, as does your player mat. When you play a card that requires resources to pay, you don’t really pay anything. There is no resource tokens. Instead, you just need to have the cards producing all these resources on the table and the resources are considered paid. And if you don’t have everything you need, that’s not the end of the world: you can trade with your neighbours. If one of you neighbours has the stuff you need, you can pass him two coins and use his resources. There’s no haggling involved, either: the price is fixed and you cannot refuse to trade. On the other hand, you have no disadvantage from it either: you gain two coins and the resource isn’t considered “used”, you can still pay your own card with it. Finally, some cards have a price, but are free when you have certain other cards. For example, a Temple in age two costs wood, bricks and glassware, but if you built an Altar in age one, it’s free. So what do all these cards do? Many of them – brown and grey ones – produce resources. Blue ones grant victory points. Green cards have one of three science symbols that award points at the end of the game for having sets of them, the bigger the set the more points. Military strength comes on red cards, yellow cards offer all kinds of useful special effects that didn’t fit anywhere else – they may make trades cheaper in one or both directions, pay money and/or points for every card of one colour you and your neighbours have or produce resources that your neighbours cannot buy from me – we wouldn’t want to help them too much now, would we? Finally, the third age has purple guild cards: all of those award extra points based on something you or your neighbours have, except the Guild of Scientists that has an additional science symbol of your choice. Back to playing the cards, there is still the third way to play them: build one part of your Wonder. To do that, you place the card under one of the Wonder spots of your player board – all except one have three of those – and pay the cost on that spot, not the cost on the card. Doing that, you gain some benefit that depends on the monument you are building: on the (easier) A side, part one and three of all Wonders is victory points while the second part has a unique special ability. On the B side, everything goes, all three parts can have points, special abilities, resources – anything. The Pyramids of Gizeh are on the boring side of the field: they are the only Wonder with four parts instead of three on the B side and all of them give you nothing but victory points. But it’s 20 of them. The Mausoleum of Halicarnassus lets you look through the discard pile and play one card you find there for free and Babylon’s Hanging Gardens let you play the last card of the age instead of discarding it. Bringing us, quite elegantly, to the end of the age. It’s almost as if I was planning these texts. An age ends after the sixth card is played, the final card being discarded. And then it’s time for war. 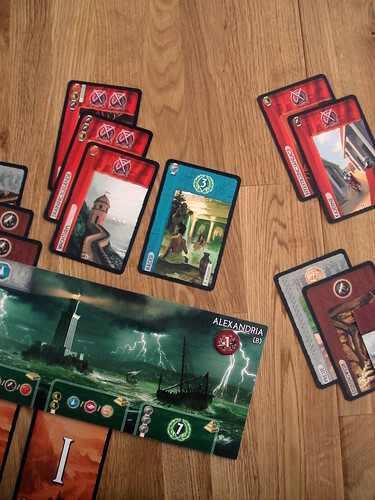 Even Antoine Bauza couldn’t completely keep the fighting out of a game of civilisation building, but war in 7 Wonders is a unbloody and above all quick affair: all players count their military strength from red cards and compare to their neighbours. Then they receive a defeat marker (-1 point) if they have less and a victory marker (1, 3 or 5 points depending on the age) if they have more – that’s it, war over, everyone can go home to their wives and children. If only real war was like that. After the third age and the third war, players sum up all victory points from their Wonder, their cards, the sets of science symbols and a couple more for their remaining money, shuffle the cards and play again. 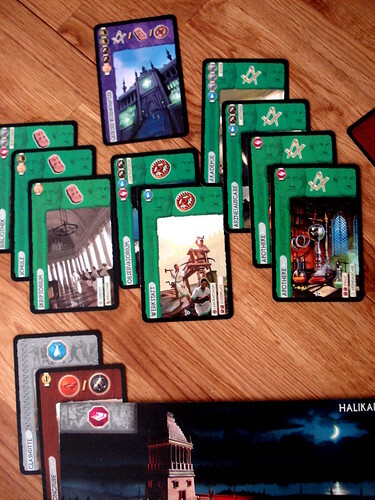 Because, in all honesty, you won’t want to play 7 Wonders just once. One game takes thirty minutes, just like the package announces and completely unrelated to the number of players since everyone plays at the same time, anyway. For the same reason, you have no downtime at all, it’s just play card, pass on, repeat, go to war. If you trust the other players. If you want to check whether they were really able to play the card they just did, it slows down a bit but still plays very quick. For a game that quick and with comparatively simple rules, 7 Wonders gives you a lot of strategic options that you only become aware of after a few games. Choosing your path to victory is the obvious one here. The number of cards you play is very limited, so you won’t be able to combine military victory, scientific progress and your monument. It often helps to decide on that early and stick to it – but not too religiously, you want to watch your neighbours: if they are aiming for military strength, then you might want to abandon those plans; an arms race is expensive in cards and there is no guarantee that you win it. Similarly, if both your neighbours start playing science cards you can assume that you won’t be seeing many of those and re-train your scientists to be lumberjacks. And of course your Wonder’s superpowers play into it as well – having an additional science symbol there is a big motivation to do the research. After a couple of games, you start to realise the same intricacies apply to more basic things as well: with your neighbour building up their resource production, it might be easier for you not to do the same but instead gather money and try to get a market for cheaper trades with them. Or be even more devious and play all the cards with one kind of resource before passing on to them, forcing them to pay you for it. Although you interact directly with only two players, these things tend to spread around the table, making every game different. 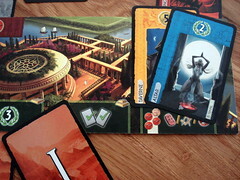 7 Wonders also deserves praise for it’s illustrations: Miguel Coimbra did a wonderful job. The components are good quality – although I did here some complaints that the cards discolour in some games, but I have no personal gripes against them. The one thing I was slightly unhappy with was the German rules – they are well-structured and easy to understand, but there is a bunch of grammatical and spelling mistakes that could easily have been avoided. The elephant left in the room is two player play: you wouldn’t have two neighbours in that case, and that changes everything. The authors solution is to add a free city between the two players that they can trade with and take turns controlling the free cities actions. It’s a solution that works, but it slows down the game and is a bit fiddly. Instead of playing this variant, I’d rather knock on a neighbour’s door and say “Hey, we’re boardgamers. We don’t eat babies because we ran out of ketchup. We need you to play with us.” With any number of players greater than two, 7 Wonders receives an all out recommendation from me. The only thing left for me to do now is apologise – either to 7 Wonders or the Spiel des Jahres jury, your choice – for repeatedly saying that 7 Wonders should have been in the regular Spiel des Jahres selection instead of the Kennerspiel. I’ll be honest: I was still thinking that after the first two games. But then I changed my mind: the rules may not be especially complex, but as I said above, there is more strategic depth to 7 Wonders than initially meets the eye, and so I’ll gladly agree that it received the right award. Tash-Kalar: Arena of Legends offers epic fantasy battles in the arena, with wizards, dragons and more. But the battle is fought in a very different way from what you expect: with pattern matching abilities.